When my book ‘Searching Jenin’ was published soon after the Israeli massacre in the Jenin refugee camp in 2002, I was quizzed repeatedly by the media and many readers for conferring the word ‘massacre’ on what Israel has depicted as a legitimate battle against camp-based ‘terrorists’. The interrogative questions were aimed at relocating the narrative from a discussion regarding possible war crimes into a technical dispute over the application of language. For them, the evidence of Israel’s violations of human rights mattered little. This kind of reductionism has often served as the prelude to any discussion concerning the so-called Arab-Israeli conflict: events are depicted and defined using polarizing terminology that pay little heed to facts and contexts, and focus primarily on perceptions and interpretations. Hence, it should also matter little to those same individuals whether or not Palestinian youth such as Isra’ Abed, 28, shot repeatedly on October 9 in Affula – and Fadi Samir, 19, killed by Israeli police a few days earlier, were, in fact, knife-wielding Palestinians who were in a state of self-defense and shot by the police. Even when video evidence emerges countering the official Israeli narrative and revealing, as in most other cases, that the murdered youth posed no threat, the official Israeli narrative will always be accepted as facts, by some. Isra’, Fadi, and all the rest are ‘terrorists’ who endangered the safety of Israeli citizens and, alas, had to be eliminated as a result. It is not at all about the type of weapons that Palestinians use, if any at all. Israeli violence largely pertains to Israel’s own perception of its self-tailored reality: that of Israel being a beleaguered country, whose very existence is under constant threat by Palestinians, whether they are resisting by use of arms, or children playing at the beach in Gaza. There has never been a deviation from the norm in the historiography of the official Israeli discourse which explains, justifies or celebrates the death of tens of thousands of Palestinians throughout the years: the Israelis are never at fault, and no context for Palestinian ‘violence’ is ever required. Much of our current discussion regarding the protests in Jerusalem, the West Bank, and as of late at the Gaza border is centred on Israeli priorities, not Palestinian rights, which is clearly prejudiced. Once more, Israel is speaking of ‘unrest’ and ‘attacks’ originating from the ‘territories’, as if the priority is guaranteeing the safety of the armed occupiers – soldiers and extremist settlers, alike. Rationally, it follows that the opposite state of ‘unrest’, that of ‘quiet’ and ‘lull’, are when millions of Palestinians agree to being subdued, humiliated, occupied, besieged and habitually killed or, in some cases, lynched by Israeli Jewish mobs or burned alive, while embracing their miserable fate and carrying on with life as usual. The return to ‘normalcy’ is thus achieved; obviously, at the high price of blood and violence, which Israel has a monopoly on, while its actions are rarely questioned, Palestinians can then assume the role of the perpetual victim, and their Israeli masters can continue manning military checkpoints, robbing land and building yet more illegal settlements in violation of international law. The question, now, ought not to be basic queries about whether some of the murdered Palestinians wielded knives or not, or truly posed a threat to the safety of the soldiers and armed settlers. Rather, it should be centred principally on the very violent act of military occupation and illegal settlements in Palestinian land in the first place. From this perspective then, wielding a knife is, in fact, an act of self-defence; arguing about the disproportionate, or otherwise, Israeli response to the Palestinian ‘violence’ is, altogether moot. Cornering oneself with technical definitions is dehumanizing to the collective Palestinian experience. “How many Palestinians would have to be killed to make a case for using the term ‘massacre’?” was my answer to those who questioned my use of the term. Similarly, how many would have to be killed, how many protests would have to be mobilised and for how long before the current ‘unrest’, ‘upheaval’ or ‘clashes’ between Palestinian protesters and the Israeli army become an ‘Intifada’? And why should it even be called a ‘Third Intifada’? Mazin Qumsiyeh describes what is happening in Palestine as the ‘14th Intifada’. He should know best, for he authored the outstanding book, Popular Resistance in Palestine: A History of Hope and Empowerment. However, I would go even further and suggest that there have been many more intifadas, if one is to use definitions that are relevant to the popular discourse of the Palestinians themselves. Intifadas – shaking off – become such when Palestinian communities mobilise across Palestine, unifying beyond factional and political agendas and carry out a sustained campaign of protests, civil disobedience and other forms of grassroots resistance. They do so when they have reached a breaking point, the process of which is not declared through press releases or televised conferences, but is unspoken, yet everlasting. Some, although well-intentioned, argue that Palestinians are not yet ready for a third intifada, as if Palestinian uprisings are a calculated process, carried out after much deliberation and strategic haggling. Nothing can be further from the truth. An example is the 1936 Intifada against British and Zionist colonialism in Palestine. It was initially organized by Palestinian Arab parties, which were mostly sanctioned by the British Mandate government itself. But when the fellahin, the poor and largely uneducated peasants, began sensing that their leadership was being co-opted – as is the case today – they operated outside the confines of politics, launching and sustaining a rebellion that lasted for three years. The fellahin then, as has always been the case, carried the brunt of the British and Zionist violence, as they fell in droves. Those unlucky enough to be caught, were tortured and executed: Farhan al-Sadi, Izz al-Din al-Qassam, Mohammed Jamjoom, Fuad Hijazi are among the many leaders of that generation. These scenarios have been in constant replay since, and with each intifada, the price paid in blood seems to be constantly increasing. Yet more intifadas are inevitable, whether they last a week, three or seven years, since the collective injustices experienced by Palestinians remain the common denominator among the successive generations of fellahin and their descendants of refugees. What is happening today is an Intifada, but it is unnecessary to assign a number to it, since popular mobilization does not always follow a neat rationale required by some of us. Most of those leading the current Intifada were either children, or not even born when the Intifada al-Aqsa started in 2000; they were certainly not living when the Stone Intifada exploded in 1987. In fact, many might be oblivious of the details of the original Intifada of 1936. This generation grew up oppressed, confined and subjugated, at complete odds with the misleading ‘peace process’ lexicon that has prolonged a strange paradox between fantasy and reality. They are protesting because they experience daily humiliation and have to endure the unrelenting violence of occupation. Moreover, they feel a total sense of betrayal by their leadership, which is corrupt and co-opted. So they rebel, and attempt to mobilize and sustain their rebellion for as long as they can, because they have no horizon of hope outside their own action. Let us not get bogged down by details, self-imposed definitions and numbers. This is a Palestinian Intifada, even if it ends today. 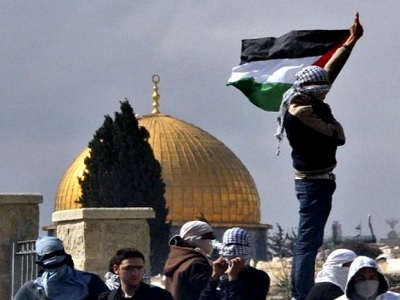 What truly matters is how we respond to the pleas of this oppressed generation; will we continue to assign greater importance to the safety of the armed occupier than to the rights of a burdened and oppressed nation? – Dr. Ramzy Baroud has been writing about the Middle East for over 20 years. He is an internationally-syndicated columnist, a media consultant, an author of several books and the founder of PalestineChronicle.com. His books include Searching Jenin, The Second Palestinian Intifada and his latest My Father Was a Freedom Fighter: Gaza’s Untold Story. His website is: www.ramzybaroud.net.